The Defense Ministry of Ukraine on Wednesday confirmed a group of pro-Russia activists has seized six armored transport vehicles of the Ukrainian army. 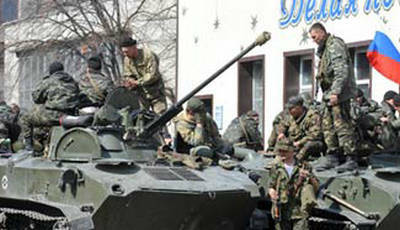 The personnel carriers, flying Russian flags, were captured in the town of Kramatorsk and driven to the town of Slavyansk in the day, the ministry said in a statement. The fate of Ukrainian troops who were at those vehicles remained unknown, the statement said. A new wave of unrest erupted in Ukraine's east over the weekend, as pro-Moscow activists seized several administrative buildings in nearly ten eastern cities, demanding a referendum on autonomy and closer ties with Russia. Six armored personnel carriers belonged to part of the actions Kiev deployed under the framework of "anti-terror" operation launched Tuesday to recapture eastern towns controlled by the pro- Russian activists.